I soak in every detail. True to character, tears flow freely. His voice resonates from the page, the writing so very much him. I haven’t heard new words from the heart of my husband in almost three years. But now I gaze at a letter I never knew existed. How can I describe what fresh words feel like? It’s like coming home to open arms, a tight embrace, and a gentle kiss. It is sun peeking from behind the clouds. It is wind in a sail. It’s a spark that lights a bonfire. Fresh words are gifts of tangible grace. They are overwhelmingly beautiful. I know I write about grace a lot; I just can’t help it. My God cares uniquely and intimately for me. A proud wife moment. This is the man I married. He loved Jesus more than anything. Even in his struggle, he knew the truth. 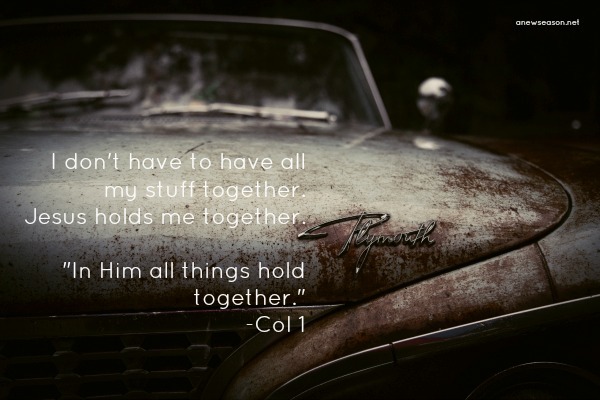 He didn’t have to hold it all together; Christ held him together. Fresh words, a lavish gift from the heart of the Father, given to my weary soul. Jon spoke truth. Almost three years later, I still get to be encouraged by it. In the long journey, God constantly imprints four words, a lavish, gentle refrain. How true! How utterly marvelous! Sometimes grace is a listening ear. Sometimes it’s a vase of flowers. Sometimes it’s a letter I never knew existed. How extravagant is the love of God for His own! Because of the cross of Christ, I am the recipient of grace– overflowing, abundant, never ending, running over, grace. God didn’t have to give me fresh words. They weren’t earned or merited. Perhaps your gifts of grace aren’t fresh words, but what are they? Have you forgotten? If you have met Christ at the foot of the cross, then He just loves you too. His words are always fresh. Father, sometimes the days are long. Thank you for evidences of grace. Help me see and rejoice over the smallest graces. Thank you for the real, tender unique care you give to each of your own. Your words are always fresh. They are better than any human words. Let me never take them for granted. Tangible Grace. God Carries Me. Next > And they shall be radiant.